Do you need evacuation help? 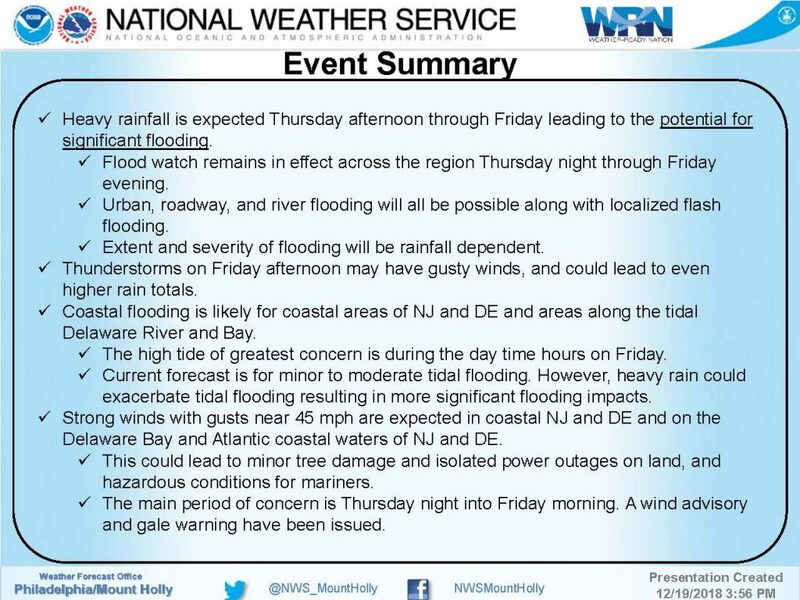 The National Weather Service has issued a Flash Flood Watch for Avalon and all of the southern New Jersey shore region. The Watch is in effect through Saturday morning.A front will be pushing through our region Friday evening which may produce showers. After nightfall, thunderstorms are possible, especially during the overnight hours, with some showers remaining through the morning hours on Saturday. There is the potential for one to two inches of rain during this storm event. Exercise caution while driving, especially at night. If you live on a street that is prone to flooding during rain events, consider moving your car off the street or to another section of the Borough. It is advisable to bring any objects that are prone to strong winds inside, including patio umbrellas. Never attempt to drive on any flooded street. If you have an emergency, please dial 911. 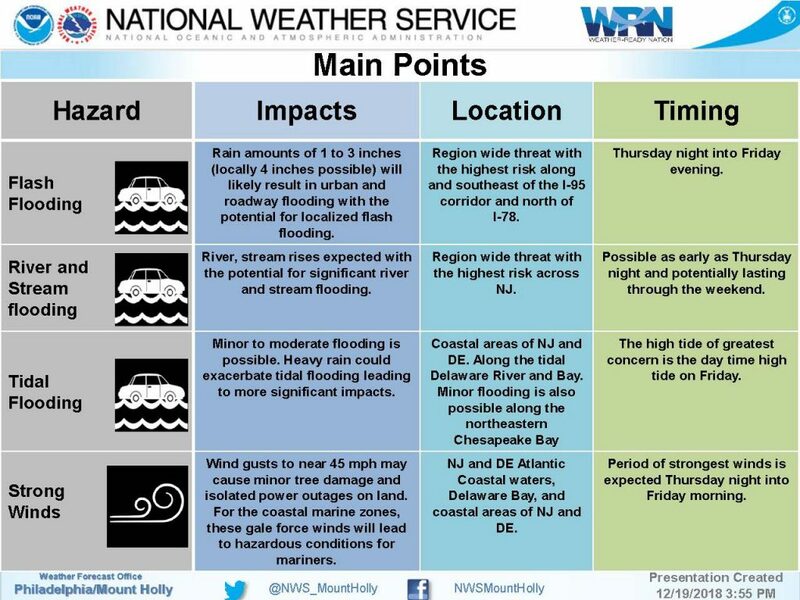 * Portions of Delaware, northeast Maryland, New Jersey, and Pennsylvania, including the following areas, in Delaware, Delaware Beaches, Inland Sussex, Kent, and New Castle. In northeast Maryland, Caroline, Cecil, Kent MD, Queen Annes, and Talbot. In New Jersey, Atlantic, Atlantic Coastal Cape May, Camden, Cape May, Coastal Atlantic, Cumberland, Gloucester, Hunterdon, Northwestern Burlington, Salem, Southeastern Burlington, and Warren. In Pennsylvania, Berks, Carbon, Delaware, Eastern Chester, Eastern Montgomery, Lehigh, Lower Bucks, Monroe, Northampton, Philadelphia, Upper Bucks, Western Chester, and Western Montgomery. * Showers and some thunderstorms, locally heavy, will move across eastern Pennsylvania and far western New Jersey early this evening. A second cluster of showers and some thunderstorms moves across the region late tonight into early Saturday morning. Areas of 1 to 2 inches of rain can be expected with local amounts up to 3 inches possible. 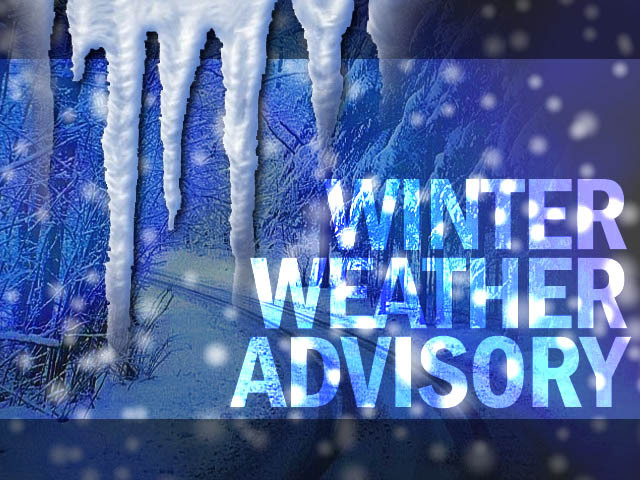 The National Weather Service has issued a Winter Weather Advisory for the Borough for the evening hours of Sunday, February 10th, 2019 through the morning hours of Monday, February 11th. There is the potential for 1-2 inches of snow during this storm, along with freezing rain and sleet. The precipitation is expected to begin Sunday, after nightfall. There is a chance that snowfall totals could be a little higher if there is little to no mixing with sleet and freezing rain. The precipitation is expected to end before Noon on Monday. 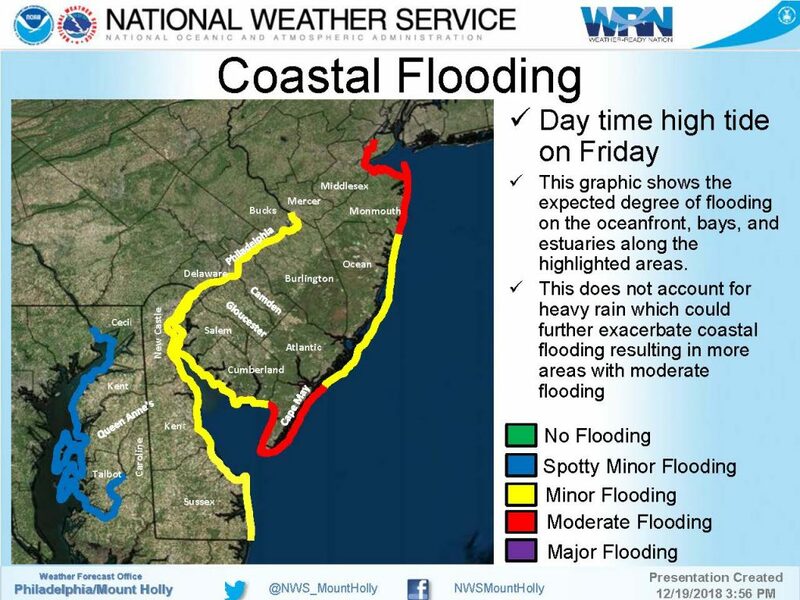 No coastal flooding is anticipated during this storm event. Please exercise caution while driving, especially during the Monday morning commute. * WHAT…Mixed precipitation expected. Total snow accumulations up to two inches expected and ice accumulations of a light glaze possible. Precipitation is expected to be mainly snow north of Delmarva but may be mixed with sleet and freezing rain farther south. Locally higher amounts of snow are possible, especially if little mixing occurs. * WHERE…Portions of southern New Jersey, southeast Pennsylvania, northeast Maryland, and central and northern Delaware. * WHEN…From 10 PM this evening to noon EST Monday. PRECAUTIONARY/PREPAREDNESS ACTIONS… A Winter Weather Advisory means that periods of snow, sleet or freezing rain will cause travel difficulties. Expect slippery roads and limited visibilities, and use caution while driving. The latest road conditions for the state you are calling from can be obtained by calling 5 1 1. The National Weather Service has continued the Flood Watch for the region, and has added a Wind Advisory for an approaching storm that will bring heavy rain and gusty winds to our region from a period from Thursday evening through Friday night. 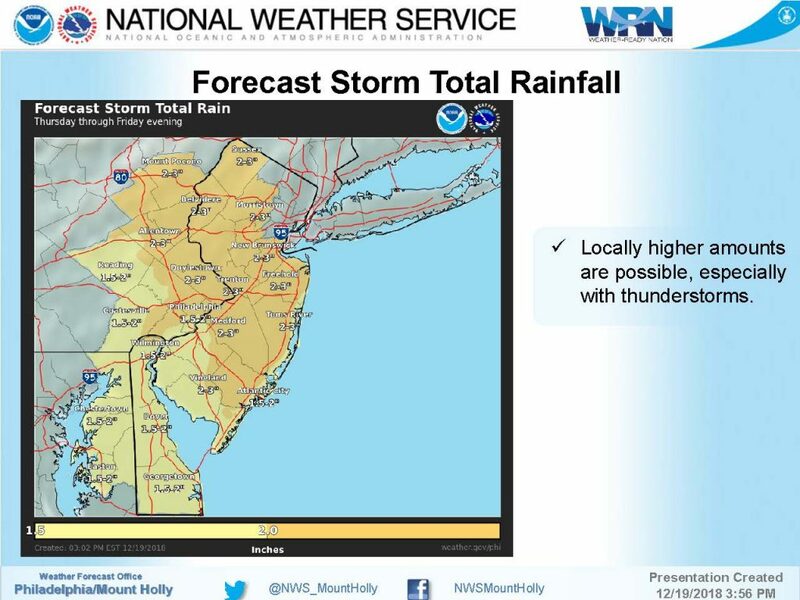 Up to three inches of rain are expected in most areas in southern New Jersey (higher amounts in some locations), and wind gusts will approach 50mph. There is also the potential for minor to moderate tidal flooding at times of high tide on Friday. The storm is expected to move into our region Thursday afternoon, beginning as rain showers. The storm will intensify during the overnight hours Thursday night into Friday morning. Periods of heavy rain and strong winds are possible Friday. The storm is expected to depart our region Friday night. The Friday high tides bring the most concern for the potential for minor to moderate coastal flooding. High tide will occur Thursday evening at the Townsend’s Inlet Bridge at 5:56pm. High tide occurs Friday at 6:22am, and again at 6:46pm. 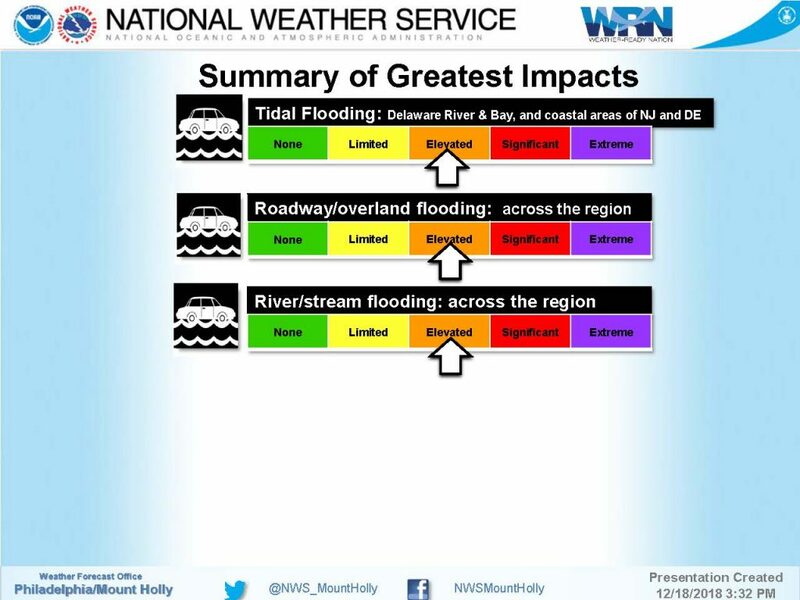 Street flooding may occur due the compounding factor of tidal flooding with heavy rainfall. Turn around, don’t drown. Never attempt to drive on any flooded street as this puts you and your vehicle at risk, and causes an unnecessary wake that can damage property. Driving on a flooded street adjacent to businesses may push water under doors causing damage that can easily be avoided by taking a different route to your destination. The Borough of Avalon has developed a flood risk map for heavy rainfall and tidal flooding events. Please review the map and make best decisions to secure your property and potentially move vehicles to areas of our community that are not subject to flooding. If you have any emergency, dial 911. 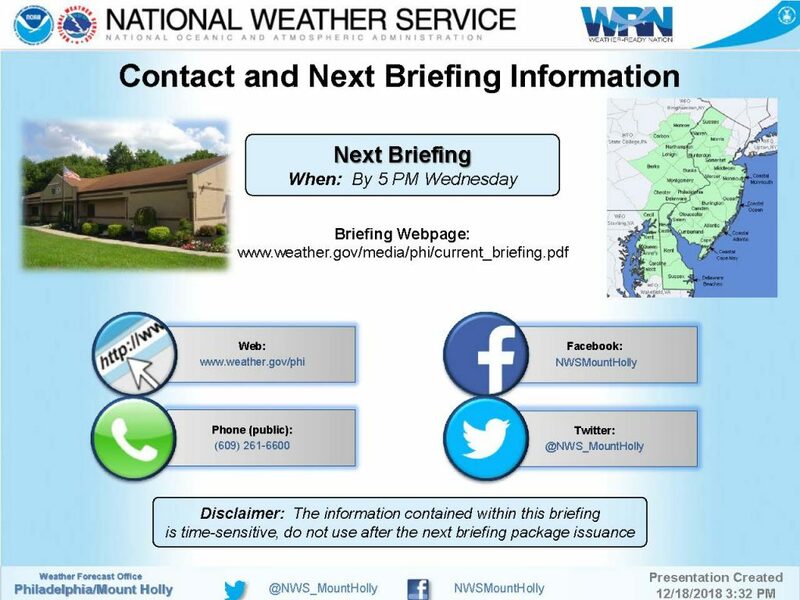 Continue to follow traditional media outlets for updates to the forecast as current weather alerts may be upgraded. 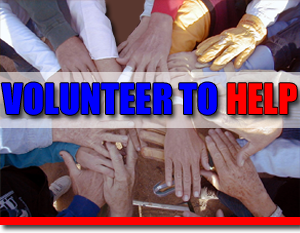 The Borough continues to be in contact with our partners at the Cape May County Office of Emergency Management for updated information from weather and state agencies. Delaware, Lower Bucks, and Philadelphia. * From this evening through late Friday night. leading to localized flash flooding. River, and the eastern shores of the Chesapeake Bay. * TIMING…Late Thursday night through Friday morning. limbs could be blown down and a few power outages may result. A Wind Advisory means that very windy conditions are expected. such as patio furniture and garbage cans should be secured. 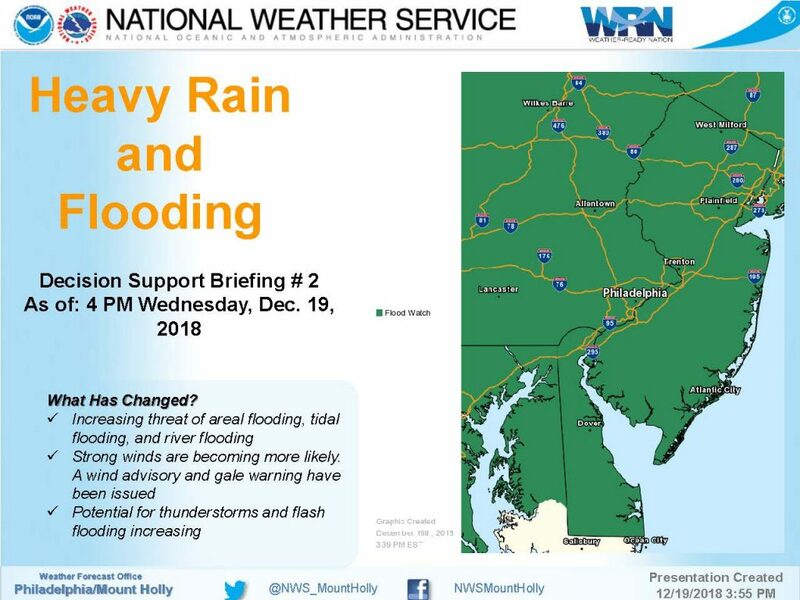 The National Weather Service has issued a Flood Watch for the Borough and surrounding communities that remains in effect from Thursday evening, December 20th, through Friday evening, December 21st. Nearly three inches of rain is possible during this rain storm event, and there is now the potential for minor coastal flooding during this storm. 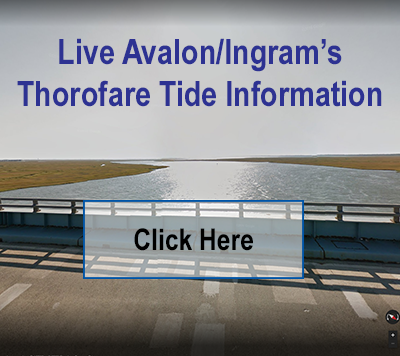 High tide will occur at the Townsend’s Inlet Bridge on Thursday at 5:56pm, and again on Friday at 6:22am and 6:46pm. 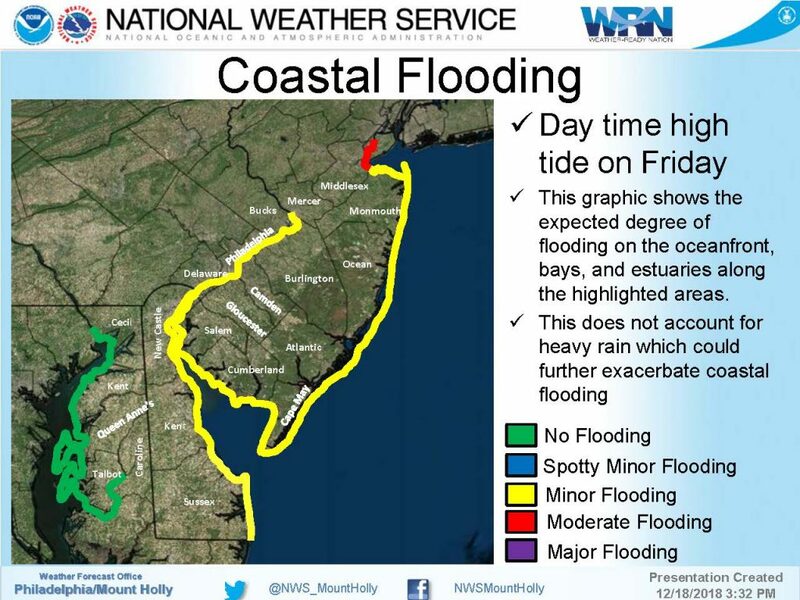 Minor coastal flooding is possible at time of high tide. Rainfall amounts may be significant. Turn around, don’t drown..never attempt to drive on any flooded street as this causes a wake that can damage property and puts you and your vehicle at risk. Wind gusts will approach 40mph during the evening hours Thursday into early Friday morning. Secure loose objects on your property; contractors should secure their job sites on Thursday. Continue to monitor the forecast on traditional media outlets. We will provide updates for you when necessary. We continue to be in contact with the Cape May County Office of Emergency Management for updates on the potential impact of this storm on our region. southeast Pennsylvania along the tidal Delaware River. 2.5 inches with locally higher amounts. along the Atlantic, Delaware Bay, and tidal Delaware River. 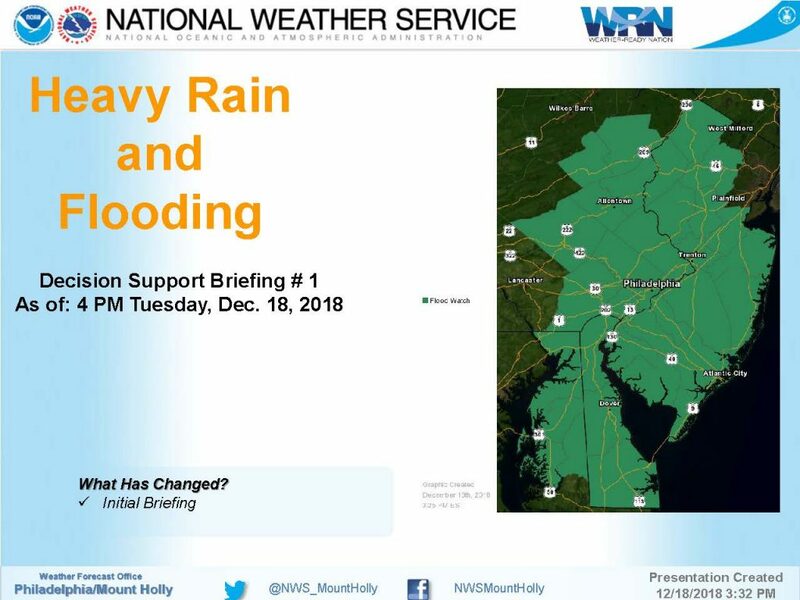 The National Weather Service has issued a Flood Watch for the Borough and surrounding communities from Thursday evening, December 20th, through Friday evening, December 21st. One to three inches of rain is expected during this storm event, and street flooding is possible. A strong low pressure system will form and visit our region with heavy rain expected, at times, during this 24 hour period. 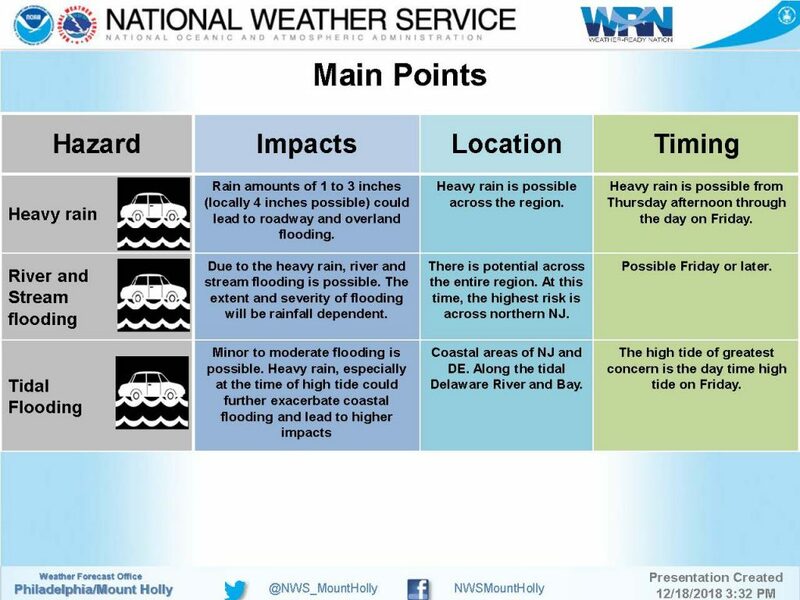 Currently, there is no expectation of tidal flooding from this storm as it may be a heavy rain event. Rain could begin during the afternoon hours on Thursday and a thunderstorm is possible during this storm. Wind gusts may approach 40mph Thursday night into early Friday morning. The weekend forecast appears to be dry and breezy, with seasonal temperatures. Remember: Turn around, don’t drown. Never attempt to drive on any flooded street as the water always appears deeper than it actually is. Driving on a flooded street also unnecessarily damages private and public property, and puts you and your vehicle at risk. Secure any loose objects on your property before Thursday evening as strong winds are in the forecast; contractors should secure their job sites. If you have any emergency, dial 911. Please continue to follow traditional media outlets for updates to the forecast. 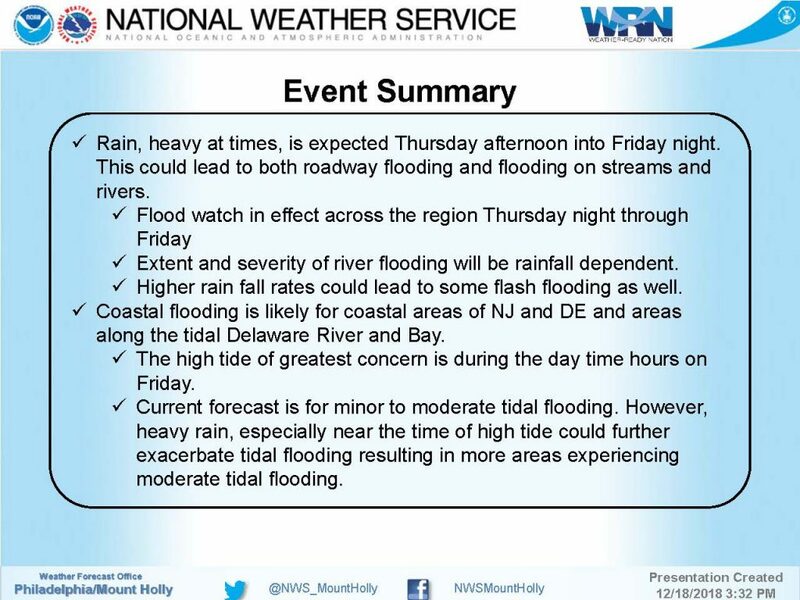 …FLOOD WATCH IN EFFECT FROM THURSDAY EVENING THROUGH FRIDAY EVENING… The National Weather Service in Mount Holly has issued a * Flood Watch for portions of Delaware, much of New Jersey, and southeast Pennsylvania along the tidal Delaware River. * From Thursday evening through Friday evening * Strong low pressure will impact the area Thursday night through Friday, resulting in a widespread rainfall of 1 to 3 inches with locally higher amounts. * Given the recent heavy rain and how saturated he ground is, this amount of rain will result in flooding of roadways and areas of poor drainage, as well as the potential for significant river flooding. 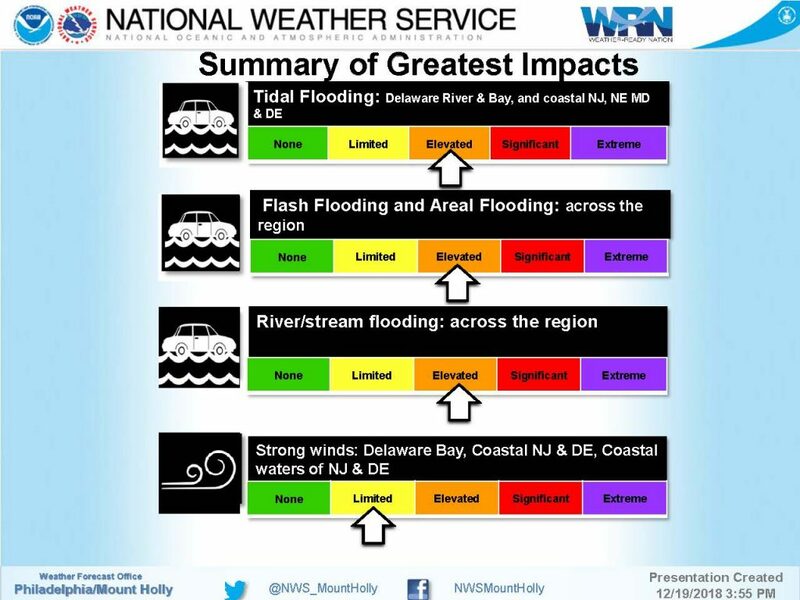 In addition, the combination of heavy rain and increased tide levels during the times of high tide will result in coastal flooding along the Atlantic, Delaware Bay, and tidal Delaware River. 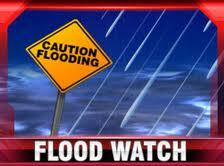 PRECAUTIONARY/PREPAREDNESS ACTIONS… A Flood Watch means there is a potential for flooding based on current forecasts. You should monitor later forecasts and be alert for possible Flood Warnings. Those living in areas prone to flooding should be prepared to take action should flooding develop.